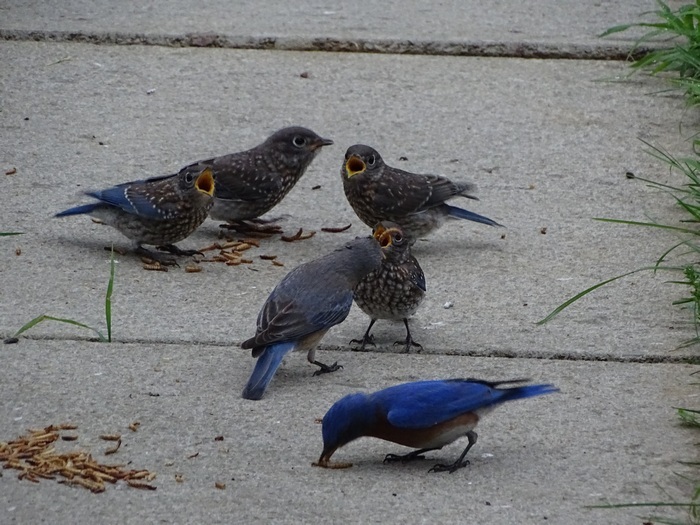 The Bluebird family continues to do well. 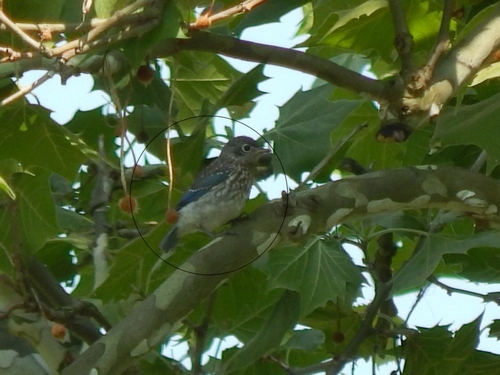 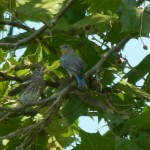 We have seen mom and dad bluebird with four babies. 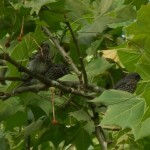 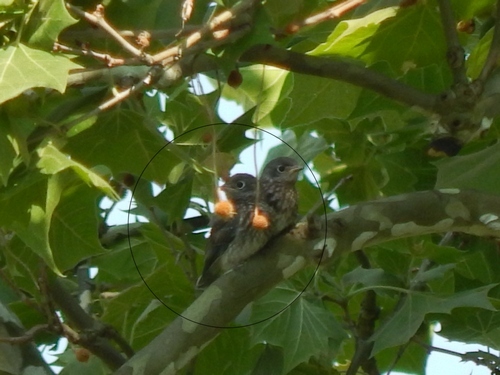 It looks like there may be two males and two females. 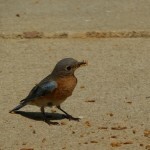 The mother bluebird has begun to build another nest in the bluebird nestbox by our sunporch. 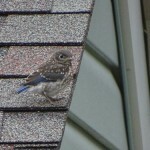 The baby bluebirds are perching on the beam right by the nestbox. 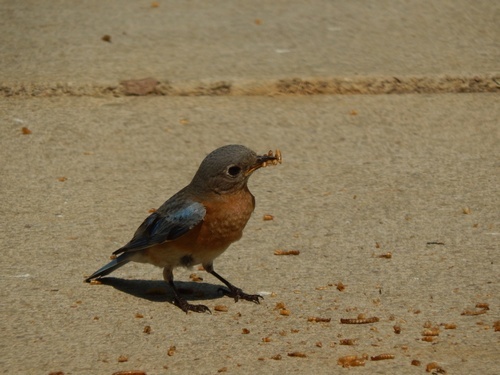 We put mealworms down on the sidewalk near the sunporch and call the bluebirds. 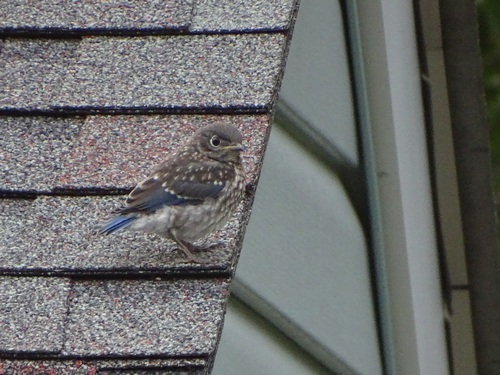 The baby bluebirds won’t land until mom or dad has checked it out. 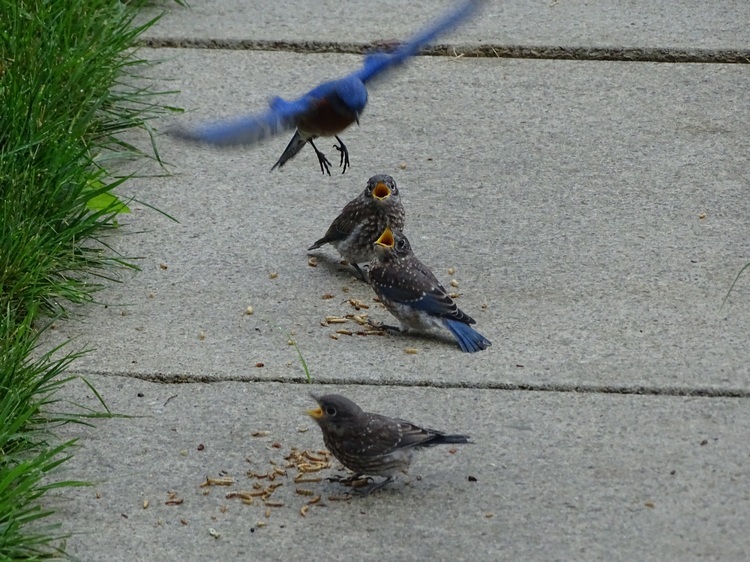 What is really funny is that after mom and dad fly away the babies will eat the mealworms by themselves, but as soon as mom or dad lands, the babies will start chirping and open their mouths real wide! 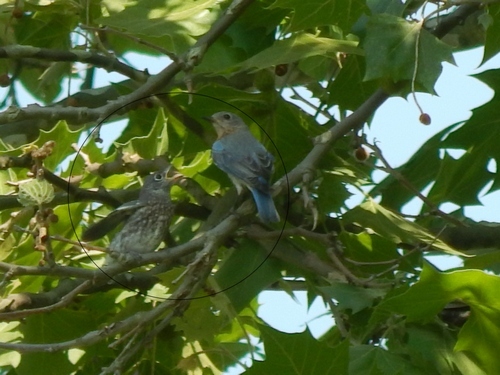 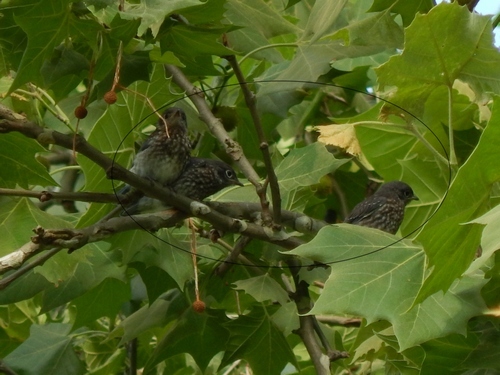 Today the five bluebird babies successfully fledged. 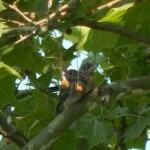 Last night the parents were very active with their trips in and out of the nestbox. 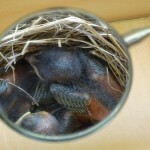 The babies kept looking out, but kept going back down into the box. 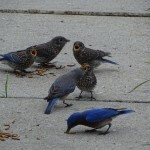 Here is a picture from last night showing mom and dad with one of the bluebird babies looking out. 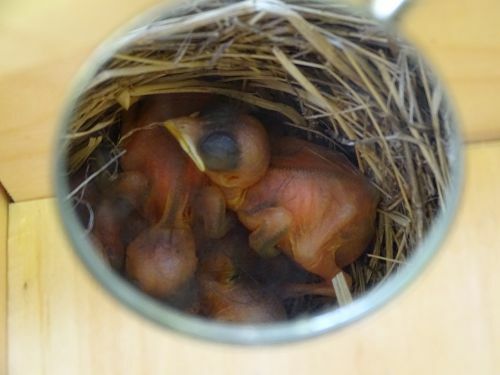 There were a total of 5 eggs laid in this nestbox. 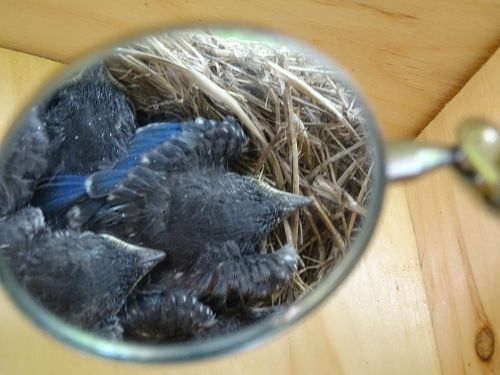 On May 21 all five bluebirds eggs hatched. 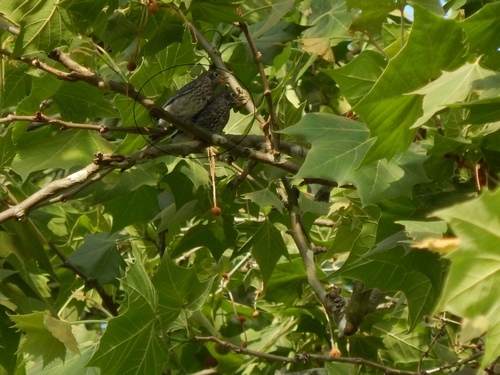 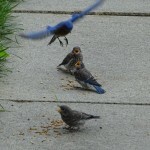 The bluebird parents are really being kept busy bringing food to the little bluebird hatchlings. 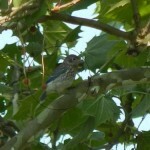 The bluebirds completed the nest last week. 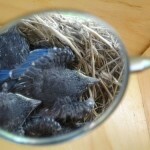 Yesterday bluebird egg number one was laid and today the second egg was laid in the bluebird nestbox. 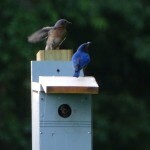 We have installed a wren guard on this box. 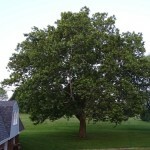 If it is successful we will share the design in another post. 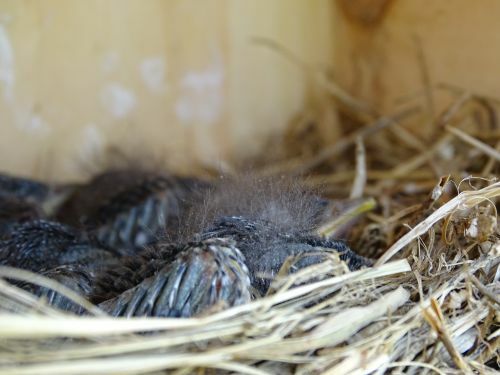 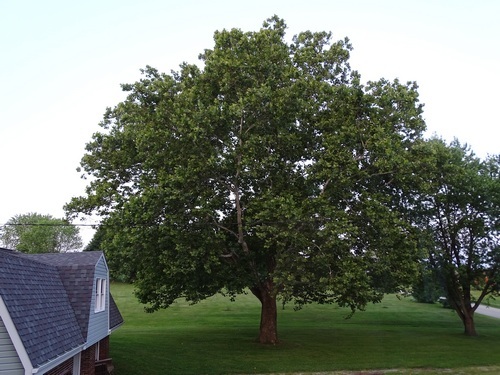 The box with the five black-capped chickadee eggs was destroyed by the house wren on Sunday. 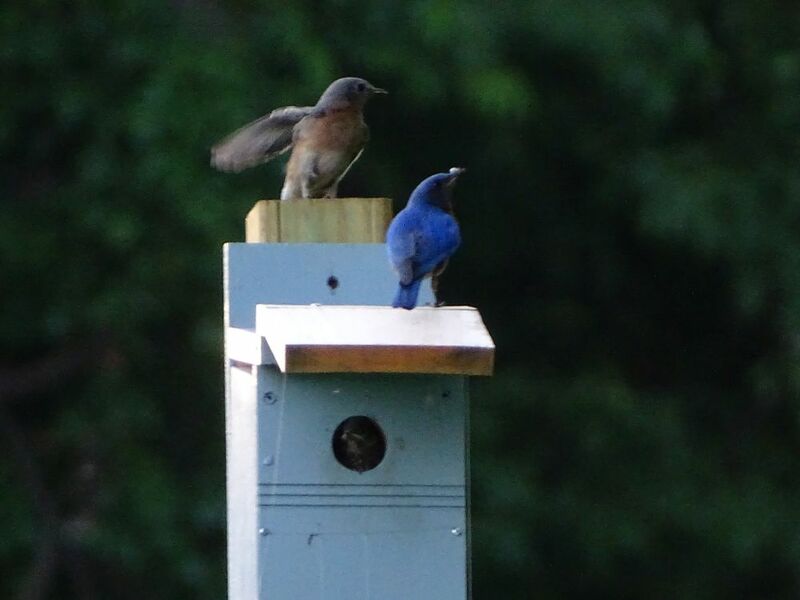 Right now there is a fight for this box between the black-capped chickadee and the house wren. 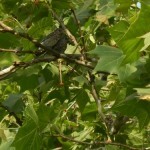 The house wren is bringing in nesting material, but the chickadee keeps looking and going into the box. 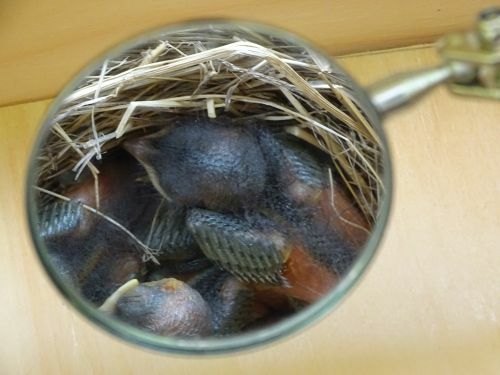 A few minutes ago the house wren brought in material and while she was in the nestbox the black-capped chickadee was hanging on the outside looking in! 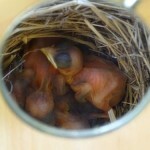 We have never had so much drama at a nestbox before. 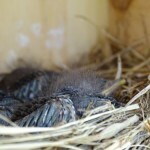 The tree swallows have nested in another nestbox-let’s hope the predators will stay away.